Note: I wrote this on Wednesday and never got to give it a final edit before posting it… so here we are two days late, but it doesn’t make me any less thankful. Today, on day nine, I am thankful for my job. Actually, I’m thankful that I even have a job in this crazy economy. But more than that, I’m thankful that I have a job that is rarely boring. I’m thankful for days like today, when I came to work with a strict schedule and a long to-do list, only to drop everything to work with a local news station on a story about childhood obesity. I’m a total news nerd, so there’s something exciting about contributing to the day’s news, and it is always fun to be involved behind the scenes. There is no better feeling than to stretch out on your couch to watch the 10:00 news after a long work day and to know that the lead story was something you dreamed up while taking your shower that morning. It doesn’t hurt when that news story involves cute, blond-haired babies. At work I have gotten to throw big parties, worked with some of the best chefs and photographers, and rubbed shoulders with some extremely creative folks. I’ve gotten to work the finish line at my favorite marathon and pitch stories for my local women’s shelter. I’ve attended 100 galas and met local celebrities. Soon I will get to dress as Mrs. Santa Claus and hand out ice Christmas cookies to my coworkers’ children. I get to see my writing in print on a regular basis, and I have convinced my husband to drive by and wave at my billboards as we pass them on the freeway. My heart almost stopped when I got a letter addressed to me labeled “Official Business from the U.S. House of Representatives.” Somewhere in Waco my freshman government professor is beaming with pride. 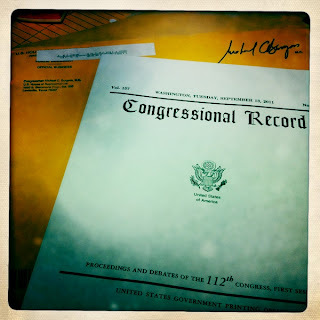 A project I have worked on for two years (part of my grad school thesis that I started in the summer of 2009) was published in the Congressional Record – Vol. 157, No. 135 to be exact. I am thankful for the wackiness I encounter every day at the office, and even more, I am thankful for the people who work with me – some of my very dearest friends, who have stood with me in the pouring down rain during events, who have helped me haul heavy boxes and stuff envelopes, and who put up with the mountains of collateral and give-away items that stack up around my office. When I got married, one of my dearest coworkers was in my wedding, and countless others came to cheer me on. After almost eight years (plus another year as a college intern, way back in the day), this place feels like family.